From musty classics to fresh blood, all horror movies have a home here where it's always Halloween! 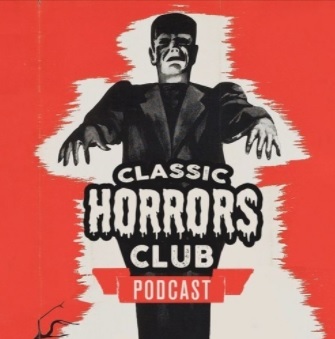 It’s a previously-unannounced meeting of The Classic Horrors Club as Jeff and I welcome Justin Humphreys in episode 30! Justin is a film historian and author of The Dr. Phibes Companion, which has been nominated for Book of the Year in this year’s Rondo Awards. 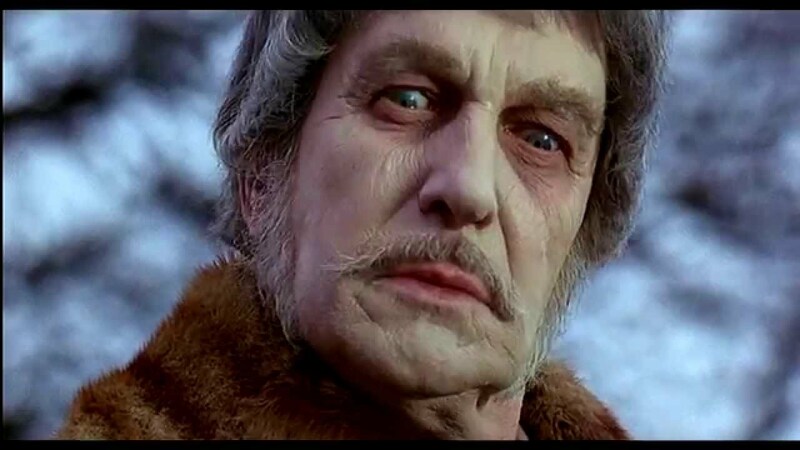 We barely scratch the surface of the Vincent Price classic The Abominable Dr. Phibes (1971) and its sequel, Dr. Phibes Rises Again (1972), but the behind-the-scenes conversation is fascinating and we appreciate Justin joining us. 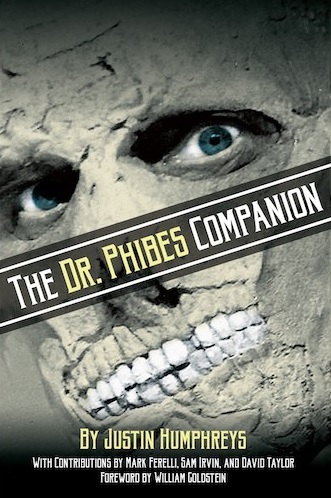 The Dr. Phibes Companion, is available on Amazon and is published by Bear Manor Media. Have you voted yet? Time is running out for this years Rondo Awards! Plot: Survivors from a doomed Mars expedition return to Earth with one unconscious and another traumatized. Through a prolonged process, we learn the tale of the ill-fated crew and the mysterious creatures they encountered on the red planet. Richard’s Review: I enjoyed parts of this fun flick but found that it definitely did drag a little at times. 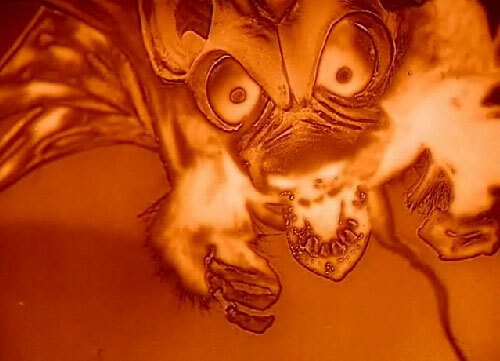 The giant rat bat spider creature is still creepy as was the amoeba. The red special effects were also cool and didn’t bother me but I was surprised by the limited sets and outdated sci-fi elements. Other shows from the same era were a little more advanced. The non-linear storytelling was unique and the cast was entertaining despite a weak script. Fun fare for an afternoon matinee. Karla’s Thoughts: I was really surprised how scientifically inaccurate this movie was considering the year it was made. 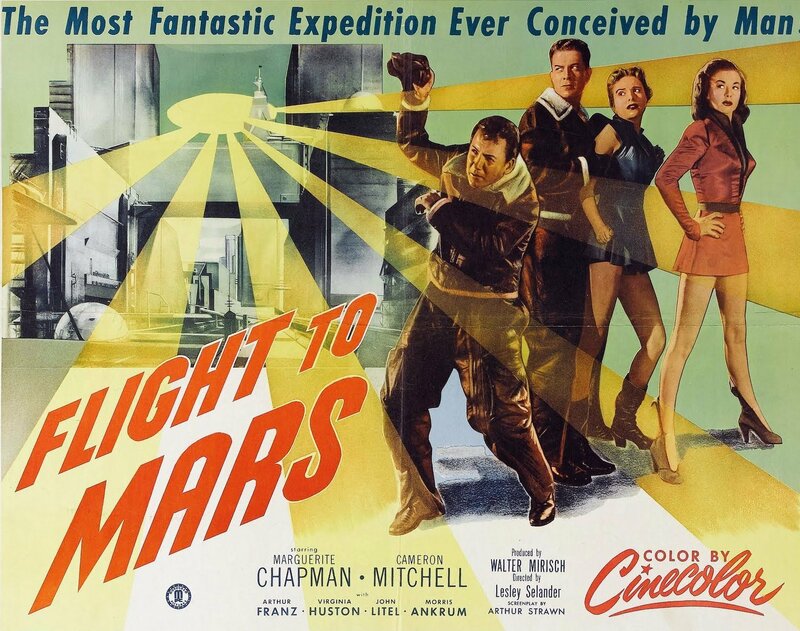 The misinformation on Mars seems dated for 1959, from the spacesuits to the weird and cartoonish red visuals on Mars. The giant amoeba and carnivorous plant were a little illogical but the spider was definitely creepy and I thought the infection caused by the amoeba made sense. I did enjoy how the story was told through flashbacks and it was definitely fun, just odd for the time period. Ted Cassidy (Lurch from The Addams Family and the voice of Balok on the Star Trek episode The Corbomite Maneuver) is the uncredited voice of the Martian. Writer and director Ib Melchior is also known for Reptilicus (1961), The Time Travelers (1964) and Planet of the Vampires (1965). Gerald Mohr died suddenly of a heart attack in 1968 at the age of 54. Les Tremayne is better remembered by genre fans as Mentor in the Saturday morning TV series Shazam! (1974-1976). 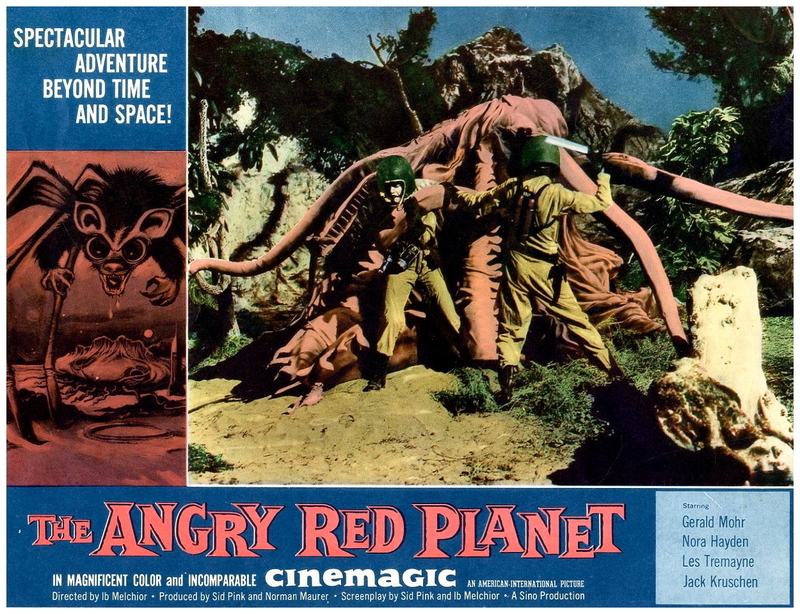 Availability: The Angry Red Planet (1959) is currently available on Blu-ray or as part of a four-film DVD set. If something frightening happens to you today, think about it. It may be…The Omen! This month on episode 29 of the Classic Horrors Club Podcast, Jeff Owens and I dive into The Omen Trilogy! We start off with the original, The Omen (1976), before things start to get a little questionable with Damien: Omen II (1978) and, finally, The Final Conflict (1981)! We also take some time to talk about the 17th Annual Rondo Awards. Check out the suggestions below for a small example of the many great nominees! You have until midnight on Sunday, April 20 to vote! Favorite Horror Host: Joe Bob Briggs (The Last Drive-In) – I still love Svengoolie but it’s awesome to have Joe Bob back! Plot: Newspaper reporter Steve Abbott joins a group of scientists on a mission to Mars. After they crash land on the red planet, they discover Martians look just like us and live in an amazing underground city. However, all is not as it seems as Mars is dying and the Martians are planning to steal the rocket ship to conquer Earth. Richard’s Review: I stumbled upon the Mission Mars Collection DVD set at Half Price Books and it is a very odd collection of forgettable old and new films with one true classic (Invaders from Mars). Flight to Mars is that forgettable old flick. It’s ultimately harmless but never really seems to offer much. The science fact seems laughable without ever being fun. Watching old science fiction films, such as Flash Gordon serials, can be a challenge but often still be very enjoyable. However, the script here never really takes off and the movie comes to a screeching halt without even a good wrap-up scene. Worth a watch once but put it low on your list. Karla’s Thoughts: I enjoyed it but there was no semblance to science fact at all. Life on the ship, the bunk beds for sleeping arrangements and the food they ate are examples of how little they really knew at the time. I found it strange that Mars had all that technology but couldn’t create a radio signal or space travel. The usual message of “Martians are bad” is present here but the ending is horribly rushed. The Martian spacesuits are left over from Destination Moon (1950) while the spaceship interior was used for Rocketship X-M (1950). Cameron Mitchell is best remembered for his role as Buck Cannon in the 1960s television western, The High Chaparral (1967-1971), as well as such genre films as Blood and Black Lace (1964), Island of the Doomed (1967) and Nightmare in Wax (1967). Although Cameron Mitchell died in 1994 at the age of 75 due to lung cancer, his last film was just released in 2018, Orson Welles’ long unfinished film, The Other Side of the Wind. Marguerite Chapman also starred in genre films Charlie Chan at the Wax Museum (1940) and The Amazing Transparent Man (1960). Morris Ankrum, Richard Gaines and John Litel all appeared as judges on the Perry Mason television series. Director Lesley Selander is known mostly for low-budget westerns with more than 100 to his credit. He did manage to direct one other genre film, Sky Dragon (1949), the last of the Monogram Charlie Chan films. 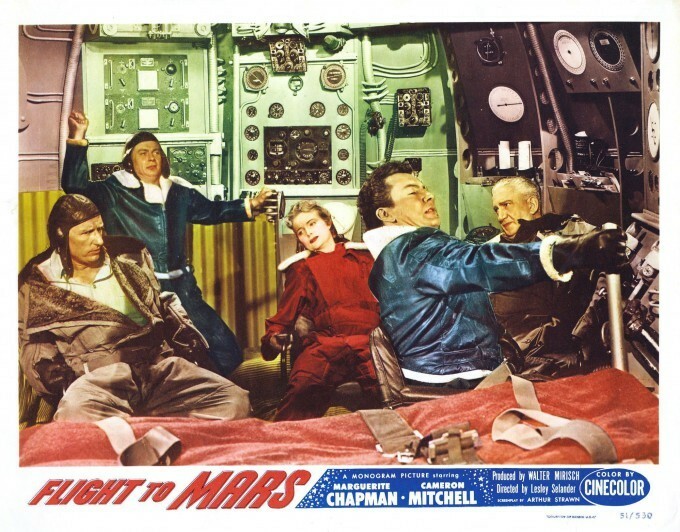 Availability: Flight to Mars was released by Image Entertainment as part of the Wade Williams Collection, both as an individual DVD and in the Mission Mars Collection. Both are out-of-print and selling for an average of $30. However, shop around and I think you can find a better price. When I started reading comics back in the 1970s, comic books were still generally lighthearted reading. You could tell the good guys from the bad guys and storylines were usually resolved in one or two issues. Darker topics might sneak through once in a while but it wasn’t until the 80s or 90s that we started to say goodbye to the old school style of stories and ushered in the darkness. Now, while I can appreciate the more adult nature of comics today, I miss the fun and laughter present in comics from the silver and golden age. Yes, I’m an old guy who likes comics, and I do appreciate everything Marvel and DC puts on the big screen these days, even though the comics have left me behind. Perhaps that’s why I really loved the new Shazam! movie so much. It honors the past while being just serious enough for the modern age. Now, let’s start by setting the record straight. Shazam is the modern name for the original Captain Marvel as created by Bill Parker and C.C. Beck for Fawcett Comics back in 1939. He first appeared in Whiz Comics #2 before moving on to Captain Marvel Adventures and The Marvel Family. He quickly became more popular than Superman and made his big screen debut in the 1941 chapter serial The Adventures of Captain Marvel. Ironically, thanks in part to a lawsuit with DC Comics over copyright infringement and sagging sales, Captain Marvel disappeared in the 1950s. DC would revive the character in the 1970s in print and on Saturday morning television before revising his origin in the 1980s, the first of many character revisions in the years that would follow. 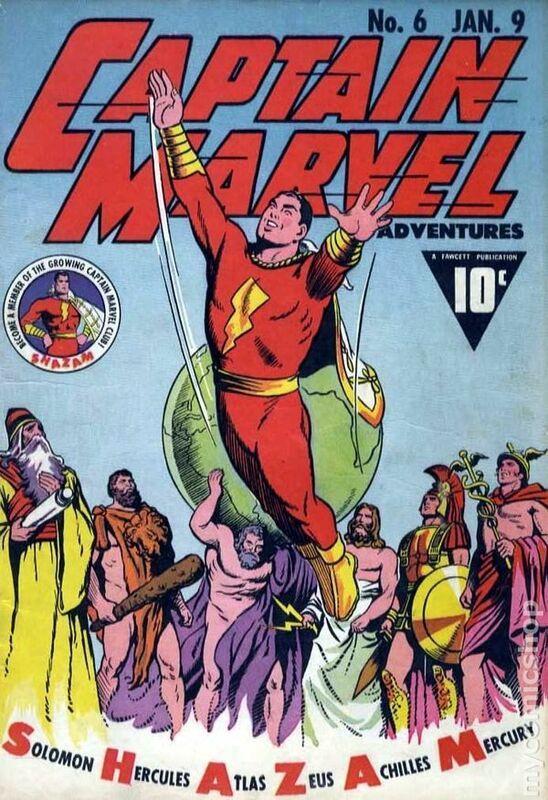 With Marvel Comics creating their own version of Captain Marvel in 1967, the DC version would soon become known simply as Shazam. The one constant in all of the various origins to the character of Shazam is that young Billy Batson acquires his powers by saying the name of the wizard who gave him his powers…Shazam. The powers come from the gods of old. He has the wisdom of Solomon, the strength of Hercules, the stamina of Atlas, the power of Zeus, the courage of Achilles and the speed of Mercury. Yes, he’s similar to Superman in some ways but very different in others. He has weaknesses, such as he has the body of an adult but still possesses the mind of a teenager whenever he changes form. This results in a much lighter and more humorous superhero, which is one of the strong points of this incredibly fun adaptation. DC has learned from their mistakes with such films as Justice League. They’re injecting more humor into the stories to help balance the action and dark elements of the movies. Following on the huge successes of Wonder Woman (2017) and Aquaman (2018), Shazam! 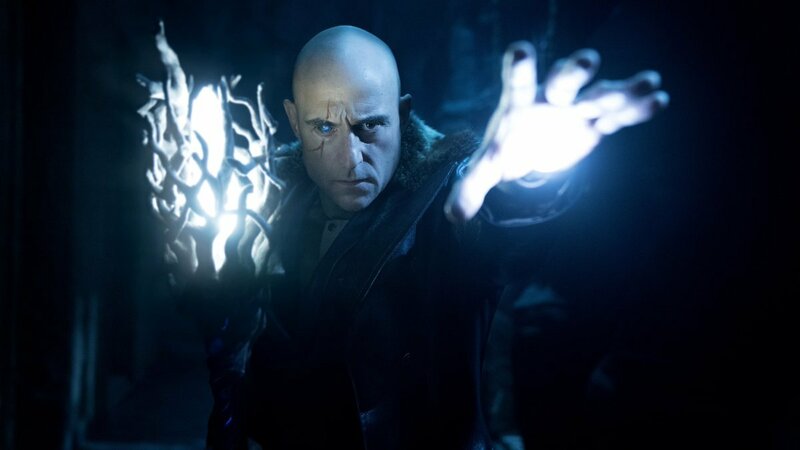 introduces us to young Billy Batson (Asher Angel) as he becomes Shazam (Zachary Levi), just in time to confront the evil Dr. Sivana (Mark Strong). Sivana was not pure enough to become Shazam when he was younger, so now he is channeling his anger in pursuit of the wizard who offered him the world and then took it all away. Enter the Seven Deadly Sins, a supernatural team of creatures hell bent on destroying all human life, and you have a classic tale of good vs. evil. The movie succeeds on all levels, from a non-complicated plot to a great cast. Levi is so much fun as Shazam while Strong is perfect as the more contemporary version of Sivana. Batson’s “family” is perfect as well. Part of the family includes the adorable Faithe Herman as young Darla, while Grace Fulton stars as Mary and Jack Dylan Grazer as Freddy, the popular characters present since the very beginning. And if foster father Victor looks familiar, you’ve probably seen Cooper Andrews on The Walking Dead as Jerry, King Ezekiel’s right hand man. And yes, that’s Djimon Hounsou (Korath in the Marvel cinematic universe) as the wizard Shazam. 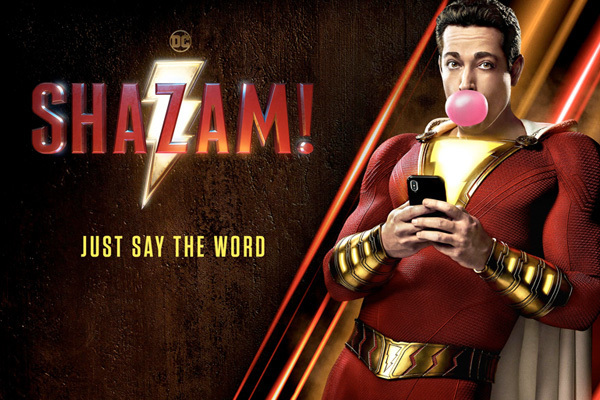 If I have to mention one minor complaint with Shazam!, it would be that the climax of the film drags on just a little too much. Shaving five to seven minutes off the final act, along with some other minor edits, would have helped the film move along even more briskly. That said, the film still stands strong in the final act. There’s a lot of humor present alongside the battles of heroes and villains, just like comic books of old. Perhaps that why I loved Shazam! so much. It entertained me and made me laugh without ever becoming too dark or too serious. 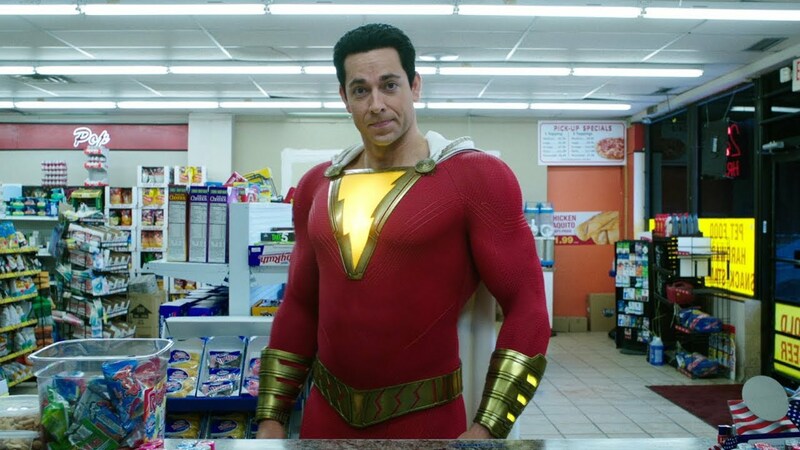 Shazam is not a dark character and should never be presented as one. With a post credits teaser and positive early reviews, it’s likely to be another box office success for DC, ensuring a sequel in the future (I’m talking about you Mister Mind). So, if you like your heroes a little lighter or if you’re an old guy who likes comics, then I think you’ll find Shazam! just as fantastic as I did. 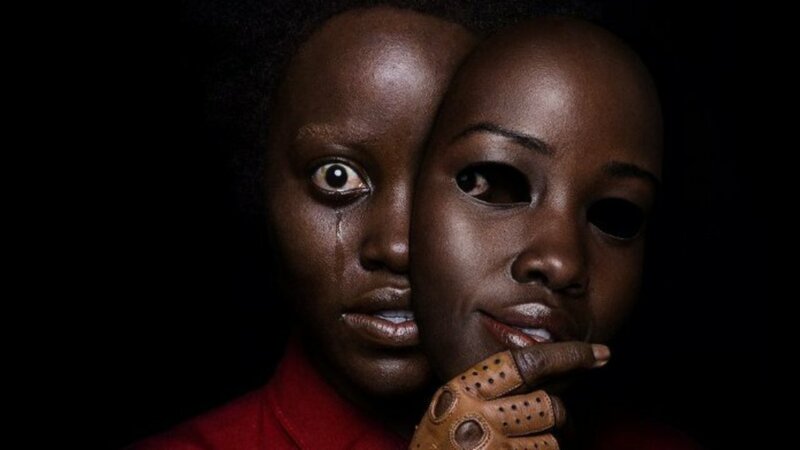 This week on episode 605 of the Dread Media Podcast, I take a look at Jordan Peele’s latest box office blockbuster, Us (2019). It was a bit polarizing as I loved certain aspects of the film while certain plot holes presented some issues for me. As always, tell ’em Monster Movie Kid sent ya! Snakes have entered the Kansas City Crypt for episode 54 of the Mihmiverse Monthly Audiocast. 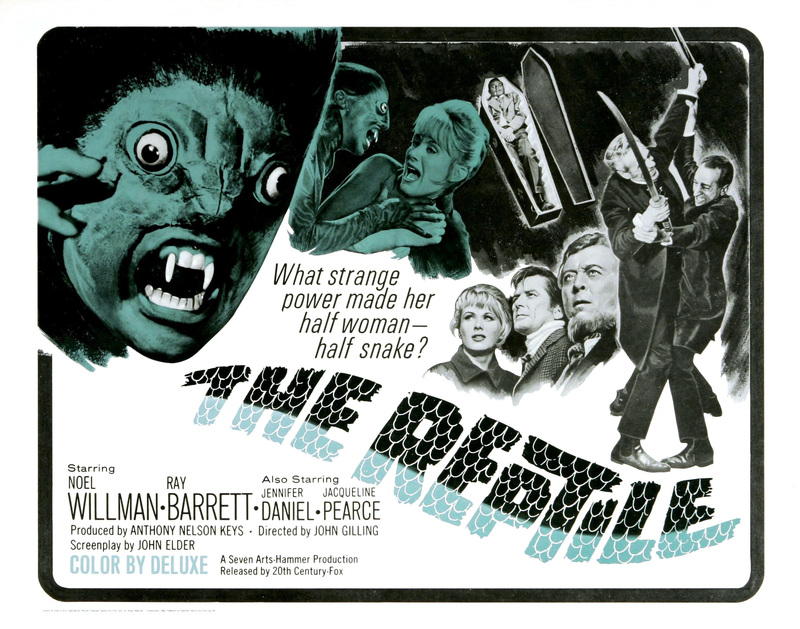 This month, as we all prepare for the latest flick in the Mihmiverse, I take a look at the Hammer horror classic, The Reptile (1966)! Be sure to check out the online home of the films of Christopher R. Mihm for all of the great merchandise and information on how you can help make future films happen! Queen of Snakes is ready for it’s world premiere on April 24 while That Which Lurks in the Dark and The Beast Walks Among Us are on the horizon. Check out the website to learn how you can contribute to these upcoming chapters in the Mihmiverse. As always, tell ’em Monster Movie Kid sent you!